Recreational activity, accessible to all types of public, men / women, sportsperson or not, adapted to all kinds of indoor / outdoor places, this original and exclusive animation will make you feel new sensations of pleasure through the practice of fencing! Thanks to the values of fencing (elegance, fair play, respect of the opponent, …), you will discover a sport where body and mind are in perfect harmony. The initiation is followed by a team challenge, supervised by the Combat instructor. Think about a group event that would be out of the ordinary? 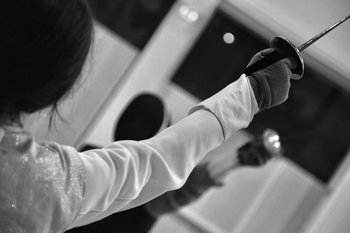 Why not invite your colleagues or friends for a fencing afternoon? A lesson in the most glamorous Olympic sport and finally learn the art of sabring the champagne! It’s a very fun experience that will help you to develop the anticipation, timing and focus.